How doctors want to die is different than most people. Stephanie O’Neill, Southern California Public Radio, August 2015. NHPCO Facts and Figures: Hospice Care in America. Alexandria, VA: National Hospice and Palliative Care Organization, October 2014. Predictors of Six-Month Mortality among Nursing Home Residents: Diagnoses May Be More Predictive than Functional Disability. Cari Levy, MD, PhD, Raya Kheirbek, MD, Farrokh Alemi, PhD, Janusz Wojtusiak, PhD, Bryce Sutton, PhD, Arthur R. Williams, PhD, and Allison Williams, ND, PhD, RN. Journal of Palliative Medicine, Volume 18, Number 2, 2015. How spirituality and religion impact patient outcomes. Ilene MacDonald, FierceHealthcare.com, August 2015. Associations Between End-of-Life Discussion Characteristics and Care Received Near Death. Mack, Cronin, Taback, Weeks, Keating, Huskamp, Malin, and Earle. American Society of Clinical Oncology. 2012. 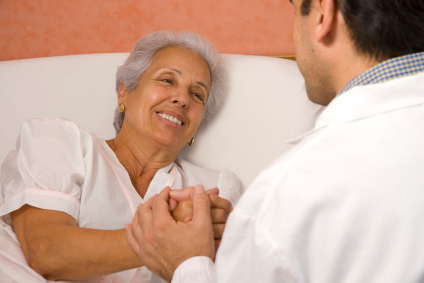 Hospice Care in the Nursing Home Setting: A Review of the Literature. David G. Stevenson, PhD, and Jeffrey S. Bramson, BA. Department of Health Care Policy, Harvard Medical School, Boston, Massachusetts, USA. Timing of Referral to Hospice and Quality of Care: Length of Stay and Bereaved Family Members’ Perceptions of the Timing of Hospice Referral. Joan M. Teno, MD, MS, Janet E. Shu, BS, David Casarett, MD, Carol Spence, RN, MSN, Ramona Rhodes, MD, MPH, and Stephen Connor, PhD. The Warren Alpert Medical School of Medicine at Brown University (J.M.T., J.E.S., R.R. ), Providence, Rhode Island; Home & Hospice Care of Rhode Island (J.M.T., R.R. ), Pawtucket, Rhode Island; University of Pennsylvania School of Medicine (D.C.), Philadelphia, Pennsylvania; National Hospice and Palliative Care Organization (C.S., S.C.), Alexandria, Virginia; and Rhode Island Hospital (R.R. ), Providence, Rhode Island, USA. Comparing Hospice and Nonhospice Patient Survival Among Patients Who Die Within a Three-Year Window. Stephen R. Connor, PhD, Bruce Pyenson, FSA, MAAA, Kathryn Fitch, RN, MA, MEd, Carol Spence, RN, MS, and Kosuke Iwasaki, FIAJ, MAAA. National Hospice and Palliative Care Organization (S.R.C., C.S. ), Alexandria, Virginia; and Milliman, Inc. (B.P., K.F., K.I. ), New York, New York, USA. Health Care Costs and Choices in the Last Years of Life. Ian Morrison, H&HN – Hospitals and Health Networks, March 2015. Hospice care is found to save money for Medicare. Don Taylor, assistant professor of public policy at Duke's Sanford Institute of Public Policy. November 2007. Reinventing Hospice to reduce costs and improve quality of life. Susan Worley, Managed Care, March 2014. Hospice improves care for dementia patients and their families. Dr. Joan Teno, Pedro Gozalo, Ian Lee, and Sylvia Kuo of Brown, Carol Spence of NHPCO, Stephen Connor of Worldwide Palliative Care Alliance, and David Casarett of the University of Pennsylvania. July 29, 2011. Letting Go: What should medicine do when it can’t save your life? Dr. Atul Gawande, Annals of Medicine, August 2010. Hospice: What is it and when is it for you? Carina Storrs, Special to CNN. July 2015. Our unrealistic views of death, through a doctor’s eyes. Dr. Craig Bowron, The Washington Post, February 2012. Seeking a ‘Beautiful Death.’ Jane Brody, The New York Times, February 2015. Why Doctors Die Differently – Careers in medicine have taught them the limits of treatment and the need to plan for the end Ken Murray, The Wall Street Journal, February 2012. The Importance of Understanding Advanced Dementia and Hospice. Moments of Life Series, National Hospice and Palliative Care Organization. African-Americans and Hospice – Against a history of medical mistreatment. StatNews, April 5, 2017. How to Talk With Your Dying Loved One (The most important conversations we ever have). Elizabeth Bernstein, Wall Street Journal, April 2018.